An article OHPI’s CEO published a couple of weeks ago in the Australian Jewish News on the problem of a small number of Jews vilifying Muslims online, and linking up with neo-Nazis to do so, is of particular relevance in light of recent news around the burning alive of a Palestinian child in Israel. The article, which appears below, hilights how a small number of Jews, including in Israel, were so intent on vilifying Muslims they were joining up with far-right bigots like the EDL and the BNP. The connection to the EDL, an English far-right street movement whose core was based on soccer fans, is particularly relevant in light of the news of that the murderers of Muhammed Abu-Khudair were all members of La Familia, a group of fans of the Beitar soccer team known for their anti-Arab opinions. One has to wonder how many of these murderers were fans of anti-Muslim pages like Islam Exposed. The probability that they were seeing such material, including material coming directly out of the EDL seems to be high. A Jew who crosses certain redlines, puts themselves outside the community. No redline is so obvious a taboo as supporting neo-Nazis. A small number of Jews, from the US, Israel, Australia and elsewhere, have been so taken in by hate propaganda spreading fear of Muslims, that they have jumped in bed with neo-Nazi groups. Their love of the neo-Nazis may be shocking, but it is their blind hate of Muslims which causes the most concern. The Facebook page “Islam Exposed” had almost 210,000 supporters when Facebook closed it earlier this month. It was the largest anti-Muslim page on Facebook and one of fifty which the Online Hate Prevention Institute (OHPI) examined in a report released last December. The audience came from around the world, about 2% of them from Australia. The page had great diversity in its administration team; it included, amongst others, a Sikh admin, a Swiss Admin, a former Muslim admin, a US Admin, and at least three Jewish admins from the US and Israel. While mostly posting links to news article that negatively portrayed Muslims individually or collectively, the page also included a range of images and posts directly vilifying Muslims. The Jewish administrators also regularly included pro-Israel material. The page liked many Jewish and pro-Israel organisations. It also liked neo-Nazi groups. I don’t use the term neo-Nazi lightly, but the Collins English Dictionary’s description the British National Party (BNP) as “a neo-Nazi political party” is entirely accurate. The English Defence League (EDL) has likewise been described as a far-right organisation. Its founder quit last October claiming the group had been taken over by extremists including neo-Nazis. 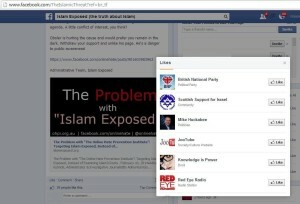 Islam Exposed “liked” both the BNP and EDL. There are of course legitimate concerns about the promotion of antisemitism in the Muslim world. There’s state sponsored antisemitism like Iran’s Holocaust denial competition in 2006. There’s antisemitism in the education system, like the UN textbooks for Palestinian Children in 2012. Antisemitic textbooks from Saudi Arabia were also found in Muslim youth clubs in the UK in 2010. The elephant in the room, however, are the terrorist groups who claim to be acting in the name of Islam. In 1980 only two of the sixty-four groups the United States designated as terrorist groups were linked to religion. In 1995 that number had grown to twenty-six out of fifty-six terrorist groups, and the majority of the religious groups claimed to be guided by Islam. There’s nothing wrong with tackling this antisemitism, extremism and terrorism. Jumping in bed with neo-Nazi groups and vilifying all Muslims is, however, not the way to do it. A briefing from OHPI earlier this year showed how content on Islam Exposed crossed the line into general vilification of all Muslims. As former Attorney-General Mark Dreyfus explained in a statement of support for OHPI’s report, content that demeans, threatens, and excludes Muslims from society increases “the risk factors associated with the marginalisation and radicalisation of Muslim youth.” Hate content targeting Muslims is not only damaging to the Muslim community, it creates a greater risk for the Jewish community and the wider Australian community. Let’s not drive people into the arms of extremists. Some Jews who support Israel and wish to combat antisemitism are instead put their efforts into vilifying Muslims. They are seeking to use Jewish organisations and groups not only to promote their anti-Muslim cause, but to attack any who dare to oppose them. These people are a tiny minority, and like the anti-Israel activists who begin their speeches with “as a Jew”, they represent only themselves. Still, they are a problem we as a community need to tackle, both the Jewish community in general and the Zionist community in particular. Before it was disabled, Islam Exposed created a “backup” page. That page is growing rapidly. In the last three weeks it grew by 13% percent to over 17,600 supporters. A petition to have the old hate page reinstated has almost 4,500 signatures. 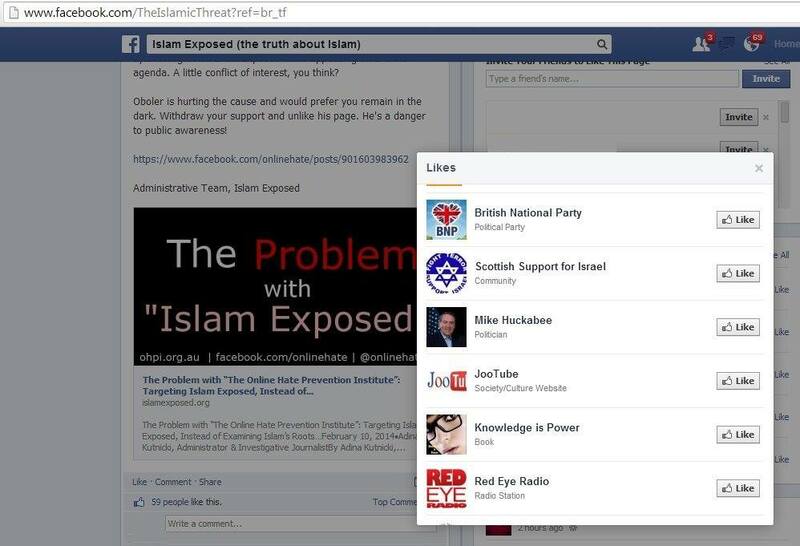 Part of the growth of support for the hate page has been fuelled by pro-Israel pages run by the Jewish admins of Islam Exposed. Their pro-Israel pages are growing, and they are seeking to use them to take anti-Muslim hatred mainstream within the Jewish community and particularly within the pro-Israel community. OHPI is aware, and deeply concerned, that there are some Australian Jews supporting these moves. We are also concerned about the level of hate in the wider Australia community. In the past week the most engaged group of users on the Islam Exposed backup page were aged between 25 and 44 and came from Sydney. The community leadership has done its part with statements of support for OHPI’s work on anti-Muslim hate from the Executive Council of Australian Jewry (ECAJ) and other key community bodies. When it comes to the spread of online hate, however, the response must also come from the grassroots. If you see someone you know in a hate group, please, take the time to speak to them and to guide them to a more productive path in the fight against antisemitism. There are legitimate campaigns to run, but targeting people on the basis of their religion is not one of them. Originally published as: Andre Oboler, “In Bed with Neo-Nazis”, Australian Jewish Jews, 27 June 2014 page 27.